This extract from the world’s first real life document by a zombie was found in a cave close to Adamsville in Florida May 2008. It’s content was considered highly classified for over a year, but finally the Obama administration made the document public. This picture was taken of the zombie author when the script was found. Then the scipt disappears, but scientists are still eager to find the remaining pages, and have put a reward of $ 50,000 for leads that may help retrieve the missing page. *56 Pounds of Raw Flesh* is the latest phenomenon on the hip hop stage. The duo from suburban London made headlines early May when they released their first cd “Born Dead….So What?”. The release went double platinum in just 3 weeks, and they are now fully booked in talk shows world wide – Oprah, Tyra Banks, Jerry Springer, etc. Story tells it, the duo was killed in a police raid and while on the morgue table before autopsy, they resurrected and striked a deal with DEATH ROW RECORDS. Tru or false, wrong or right? The Duo of Death is here to stay! Let us at Zombie Possum be the first to congratulate Elizabeth and John Kimani for delivering the first zombie baby born with non-zombie parents. Elizabeth became pregnant during the couple’s vacation in Albania last year. She fell from a 20 storey buildning to, what everyone thought, was her certain death, but she survived as in a miracle. Her belly was seriously severed during her first 6 months of pregnancy and she had constant cravings for raw flesh and brains, but she was alive nontheless. Early June the couple checked in at Martha Winefarts ”Private Hospital for Unexplained Pregnancies” in Jonestown, Gyuana where she was treated with blood transfusions, amputations and eye socket cleanings on a daily basis until their son was born. 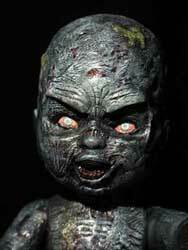 He will be called Bubba in a tribute to the Evil Dead Triology actor Bruce Campbell’s caracter in “Bubba Ho-Tep”. We at Zombie Possum are handling the congratulations, and flowers to the couple can be sent through us. Little known is the Centre for Zombie Research in Littletown, Arizona. Here, scientist have identified the zombie as the missing link in human evolution, and they are questioning the Z-virus as the source creating zombies, and they have actually seen the missing link between zombies and humans from one missing cromosome – the Z cromosome which all zombies are carrying. The Scientist presented in early August 2008 an article where the Z cromosome was presented with heart breaking facts, although it was written off as a comedic gag by other predominatly Republican scientists. However, to this day humans are being infected by the zombie virus, and the scientific evidence point to a Z cromosome inside all of us that slowly takes roots. Those already carrying the Z cromosome need to contact the Centre for Zombie Research for immidiate testing, otherwise they face a future of true horror when the zombie virus breaks through and threatens to turn even living people into zombies. No longer must man die to become zombies – the true fear lies inside of you! We are happy to announce the first legal zombie wedding ever. Lucky Mary Dumpling from San Francisco was married to her high school sweetheart Jon Avril May 29th in White Chapel outside of Oakland. The lucky couple met 8 years ago in the school swimming team, but Jon sadly drowned during a summer vacation swimming drill. He was dead for 3 hours before turning into a zombie. Then he was taken by the U.S. government’s Zombie Task Force and was kept in their custody for almost 4 years when suddenly released. Mary was by then married to another man, but when she saw her sweetheart Jon she divorced, even though he was decomposed and filled of rotten flesh. Some may argue it is strange that California may legalize zombie weddings, but are still banning homosexual ones. It is true it is strange…..
Can one joke about the Living Dead? The tragedy that is the living dead is created by a virus which affects the brain and ultimately the whole body of those dead, or dying. Therefore it is of utmost importance to ensure the destruction of the brain when the zombie infection is suspected. But can you really joke about this virus, after all, jokes about HIV/aids or cancer is not very funny. In Hollywood and offspring there are constant humorous movies made that actually in between all the jokes and gags have a respect for the undead. In the movie RETURN OF THE LIVING DEAD from 1985 the zombie virus is in detail shown how it affects the recently deceased and brings them back to “life” as zombies. The movie is a parody of the true events portrayed in e.g. NIGHT OF THE LIVING DEAD and the Italian ZOMBIE HOLOCAUST, but still it brings some true stories. In recent times, the English comedy stars Simon Pegg and Nick Frost starred in SHAUN OF THE DEAD, which is a hilarious epic about a sudden and fairly short zombie outbreak in present day London. The movie is dead funny, but is also a mind boggler for how to understand and react to the virus which so easily can affect us on the day of our demise. The movie Return of the Living Dead has 4 follow up movies which in some ways also turns fiction into truth. Recommended for those who are not fully true believers of the zombie existence (and can’t take the blood and gore of the movies based on true stories). The sight of a pregnant woman is always beautiful, but little is known of the debate behind pregnant zombies. The main reason for this lack of debate is of cause the wide misconception of zombie excistence (or fear of realizing the truth). Nonetheless, even though the hospital staff used to have problems with eaten new borns, the trend has declined due to new electric fences to throw the mothers on just after birth. They are then stunned and removed from campus. Most zombie newborns grow up at the hospital’s nursery until they are grown up enough to kill and eat brains on their own. One of the biggests assets for the hospital is the quantity of nurses. Some Pro-“Life” demonstrations occur and killings of doctors happens. 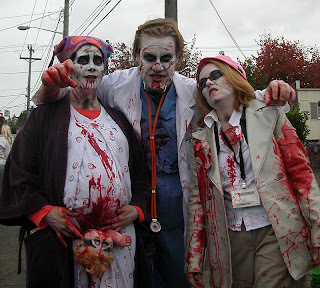 They positive thing about this is that those dead doctors are given endless bites by the zombie mothers so they too become zombies. They are both well educated and dead, which will provide the zombie mothers with sufficient assistance in their new role as parents.